I took this photo today after a storm has passed over and the sun was pretty low. 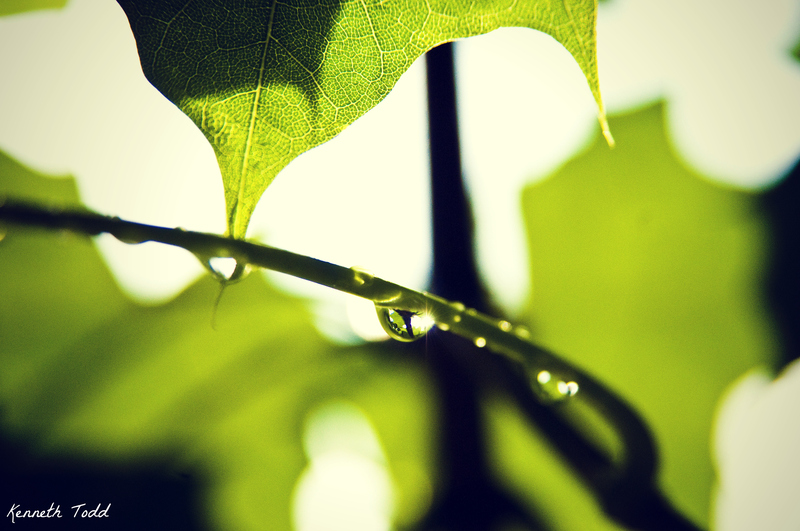 The sun is reflected through the water droplet which is on the stem of the leaf. It has a nice little star burst effect too. I also like the details on the leaf above it. What a creative shot! Give a feeling of peacefulness. Sometimes we just can’t care what others think 🙂 Standing/walking in the rain can be so cathartic. Tks Joanna. You know whenever I see water now and I have my camera, I think of your blog. Thanks for the inspiration. You are very welcome…I’m glad to be an inspiration!